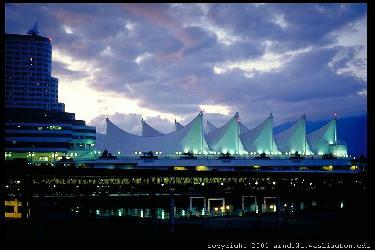 Vancouver was recognized as the Top City in Canada in Cond� Nast Traveler magazine’s 2012 Readers’ Choice Awards. The city was also named the Top Destination in Canada in TripAdvisor’s 2012 Travelers’ Choice awards, and was chosen as the world’s “Most Liveable City” in 2010 by the Economist Intelligence Unit (EIU), a title it has been awarded eight times since 2002. Vancouver offers travellers both outstanding opportunities for outdoor adventure and the sophisticated amenities of a world-class city. Take advantage of the city’s oceanside location, with plenty of green space and many recreation opportunities in the mountains 20 minutes north of downtown. After a busy day, linger over a glass of BC wine and a locally inspired meal, or unwind at one of Vancouver’s unique spas. While this sea-level port city is known for its temperate climate, the surrounding snow-covered slopes are perfect for winter sports and breathtaking views of the city twinkling below. Vancouver is one of the few places in the world where it’s possible to ski in the morning and sail in the afternoon.